Being well rounded, a Jack (or Jill) of All Trades, is important to me. I'd much rather be pretty good, or pretty knowledgeable, about a bunch of things than spend all of my time focused on one thing. It makes me stronger, more aware of things I can do to improve myself, and prevents me from burning out, both physically and mentally. The pursuit of many things keeps me challenged; it keeps my body and mind guessing. It also might help explain my incredibly short attention span. To an extent, I think this applies to life in general, but more specifically, I'm talking about climbing. I like to spend my time outdoors doing a whole bunch of different things, and have found this is a sentiment shared by most outdoorsy types. You'll rarely find someone who just climb, or just hikes, or just bikes, at least in my experience. We all have a favorite activity, of course, but we also tend to have a bunch of others we enjoy. When the weather's nice here in southeastern PA, I have trouble decided whether I should get out the road bike, head to the Poconos for a hike, or grab my climbing shoes and pick a new area to try out. I went to Go Vertical last night, a typical Tuesday night, and declared it was going to be a bouldering night for me. I just signed up for the Earth Treks Roc Comp, and figured if I'm going to "rub shoulders with [my] climbing idols" in a month, I should at least attempt to get a little stronger. I got home just before 10 pm, fingertips red and throbbing, feeling absolutely elated. I love bouldering. 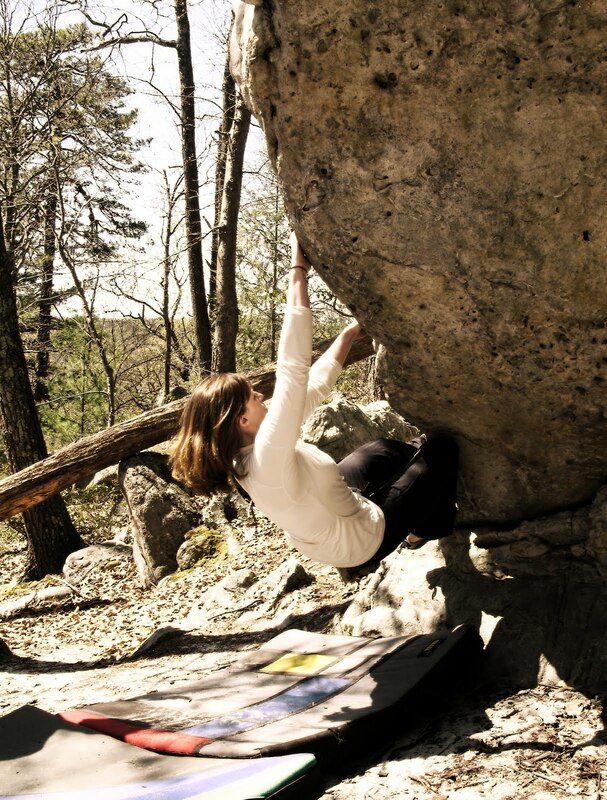 Indoors, outdoors, overhanging, slabby, crimpy, slopey, all kinds of bouldering. It's important to be a well-rounded, competent climber. You'll be safer, your muscle memory bank will be bigger, you'll be stronger, you'll improve more and faster, and you'll be a smarter climber. And I've found I'm a better climber if I spend more of my non-climbing time hiking, biking, and getting into better overall condition. Well-roundedness is good! The problem is, I can't help how much I love bouldering! I know I should lead climb more, I know I should work on my endurance more. But I love how it feels to shift your body just perfectly from one move to the next; how it feels to be so close to complete muscle failure and lunging for the finish hold; how it feels to desperately thrown your heel over the edge and engage every muscle in your leg to pull yourself up and top out. And how it feels to use all the strength you have just to hang on because you know if you fall off, you have to start all over again. If I had a choice between that and any other climbing discipline, I'd choose it over 90% of the time. And I have no idea why. Maybe it's figuring out the aptly named "problems." Maybe it's the near-instant gratification of making a handful of really difficult moves and completing something. Maybe it's the self sufficiency, and being able to do it without trusting anyone else to hold a rope that isn't there. Maybe I like the sprints instead of the endurance tests. Maybe it's because being up high and falling is really scary. But does the "why" really matter? Can't I just love it without needing to understand why? As much as I know toproping and leading are important in my quest to become a well-rounded climber, bouldering will always be my favorite. If you're a climber, do you have a favorite discipline, or do you endeavor to be good at everything? We'd love to hear from you!